Sergio Corbucci's The Great Silence stands out amongst the many spaghetti westerns for a number of reasons. The two that stand out most prominently are firstly it's setting, rather than the usual dust bowl towns of the genre, this film is set in the snow with the Pyrenees standing in for the Utah mountains. Second is the film's sensational ending for which it is justifiably famous. An alternate and completely different ending was filmed for the African market, and this hilarious version is included as an extra (without audio) on the recent region 2 dvd release. 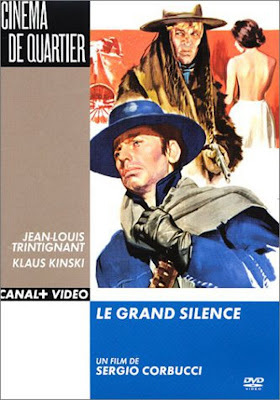 Silence (Jean Louis Trintignant) is a mute, roaming gunslinger for hire, his quirk being he only shoots in self defence, drawing second but shooting first. He's hired by a widow (Vonetta McGee) to avenge her husband's murder by Tigrero (Klaus Kinski) leader of a ruthless bunch of killers in the guise of bounty hunters. Standing between them is the new sheriff (Frank Wolff) in town. 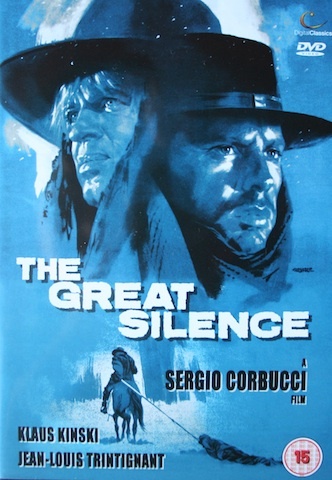 A truly exemplary example of it's genre, The Great Silence has a unique feel and atmosphere thanks to it's snowy setting. From the opening shots of the film captured superbly by the cinematography, it's clear you are in for something special. The desolate beauty of the setting matching the film's icy heart. The snowbound setting also allows for fresh ideas, such as the snow being used to store the bounty hunter's victims bodies. The lead performers are all excellent, with Trintignant making for a fantastic brooding hero. The decision to make his character mute was a great one, in addition to adding multiple meanings to the film's title, it really pushes his acting ability to achieve the levels of expression required. It also sets up a superbly executed flashback scene to explain the reason he's mute. The beautiful Vonetta McGee gives great support as the desperate for revenge widow, in an unusually meaty female role for the spaghetti western genre. Klaus Kinski excels as the incredibly callous leader of the bounty hunters. He really revels in the role and seems like he's having a blast, thoroughly enjoying Tigrero's despicable nature. He strikes a fantastic balance between being chilling and amusing. Corbucci's direction is excellent, using inventive angles and camera placements with only a few of the director's trademark zooms looking a little awkward and out of place. With The Great Silence and Django on his resume, Corbucci is second only to Sergio Leone as far as spaghetti western director's go. Speaking of Leone's work, Ennio Morricone provides the soundtrack for The Great Silence and much like the film itself, the score is unconventional, it fits the film perfectly, greatly adding to the atmosphere. A cracking western, it has darkly humorous moments but is in the main as bleak and pessimistic as movies get. 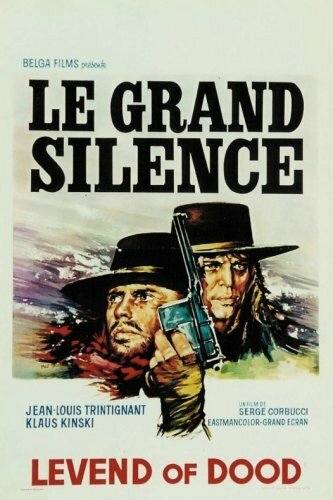 Whether you're a fan of westerns or not, The Great Silence is highly recommended as a superb movie regardless of the genre. The most recent region 2 dvd is a significant improvement on the first UK release as it's anamorphic, purists will argue the Fantomas region 1 release is the only version to have as the aspect ratio is correct at 1.66 rather than the 1.78 or so of the UK version. However the Fantomas dvd isn't anamorphic and I can live with trading off a little extra matting for the increased resolution. A great, great movie (and I'm probably going to throw out some spoilers here, so fair warning to those who haven't seen it). THE GREAT SILENCE is really the realization of what Corbucci was trying to do with DJANGO; create an anti-Western Western. 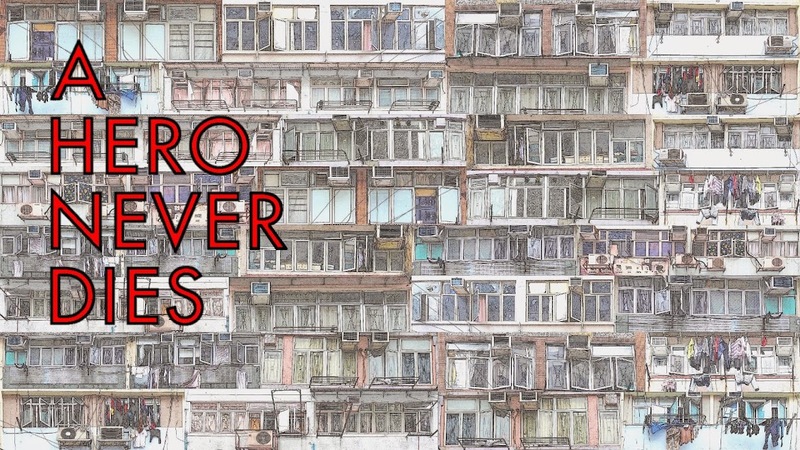 Everything is like a mirror image of the American tradition, and a critique of American self-image. He trades dry desert for relentless snow. The hero is the black-clad mercenary, the fellow who would usually be the villain in such pieces. The good-natured sheriff doesn't save the day; he can't even save himself. The peace-loving farmers (here represented by a band of persecuted Mormons) don't go on to build a great nation, the hero and the widow don't ride off into the sunset together, and good doesn't triumph in the end. The American Western became, in the 20th century, an integral part of the American foundational myth. Like most, it's more myth, legend, and nonsense than anything one would mistake for history, but people came to believe it on an emotional level, and it became important to them. What makes the ending of THE GREAT SILENCE truly devastating--and that's the right word for it--is the ugly emotional truth of it, in the face of that myth. Oh! great article, Looks promising, am going to give this a try. Thanks for your long and thoughtful comment Cinemarchaeologist, excellent points you make on a truly great film! Fantastic write-up! The Great Silence is an amazing movie. One Of Corbucci's best. Great stuff, Martin! This is one of my favorites. I heard about the ending ahead of time and was still floored by it. Kinski was amazing here. The ultra violent Wakayama television series THE MUTE SAMURAI was inspired by this, and it, too, was terribly downbeat and somber. Have you seen Corbucci's HELLBENDERS? It has a similar tone to SILENCE. Another movie that I have shamefully not seen. Mostly due to my ignorance of the western genre. I'm curious, would you have some other Italian westerns to recommend? What's the best place to start for a newbie? Thanks Brian, I have Hellbenders to watch, just haven't got around to it yet, sounds good. I've never heard of the Mute Samurai show you mention, it sounds great do you know if it's available anywhere? Dusty, Presumably you've seen all the Leone's, after those the Corbucci's are excellent. Django is a great place to start, death rides a horse would be another decent starter before moving onto some of the weirder stuff such as Django kill. 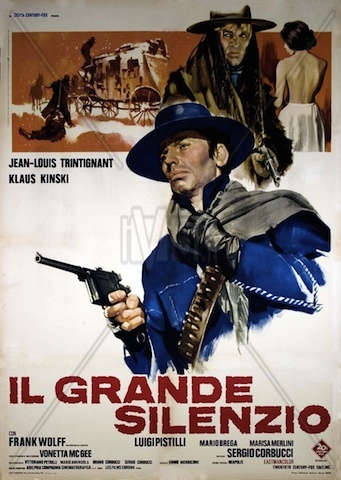 The GGTMC have covered some great Euro westerns on their podcast too! Amongst the ten greatest/most important Euro-Westerns. Tentas. Welcome to the blog. Yes I completely agree.